The Ribbons Design is exactly what the name declares a background of overlapping ribbons. 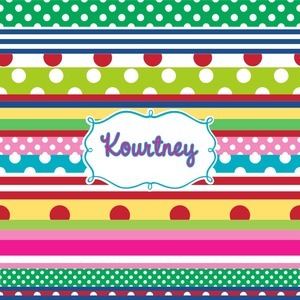 This dynamic design includes ribbons that have different patterns of polka dots, stripes, and solids. The pattern does not have a principle color but does include light green, dark green, light pink, hot pink, red, yellow, light blue, dark blue,and white. The center of the design is a label which can be personalized. You can keep the label as is or change the colors. In the label, you can put your name or other text.